Another 12 wins & 47 nominations. With that in mind, this is an excellent show. While I do not feel that Angel has necessarily bested Forever Knight yet, I think that it very well might. The show manages to balance the fearsomeness of the supernatural undertones with a certain exuberance and delight that I am definitely impressed with. The show can be truly funny. Angel is not a typical horror show, as it deals much more with human relations than it deals with the supernatural. And it deals with human relations in a much more mature and intelligent manner than most so-called dramas on TV. I must admit that I was skeptical when I heard all the praise being heaped on this show by critics before it started, but they were right. Between Angel and Buffy, I don't really think that any other network touches the WB for pure creative output. I am impressed with the direction that this station has taken, and hope that they continue in the future. Each episode has quick flashes of images between most scenes. 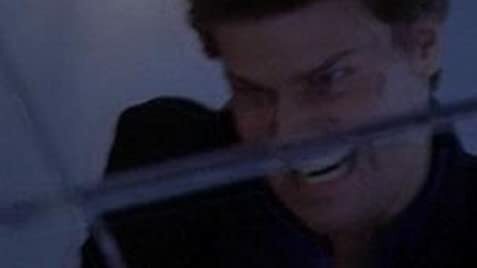 In Angel: Epiphany (2001), for instance, between the scene with Angel and Darla, and the scene where Angel goes to save Kate, there is a quick flash of a crew member holding a slate marker. For a large portion of season 5 Spike is incorporeal. He is not meant to be able to interact with physical objects, and is seen passing through people and walls. However as is the case in most scenarios of this nature, he is inexplicably able to sit in chairs or occasionally interact with larger set pieces. During the first seconds of the opening credits, the red rim of a chalice in the background forms the shape of a halo over the name ANGEL.